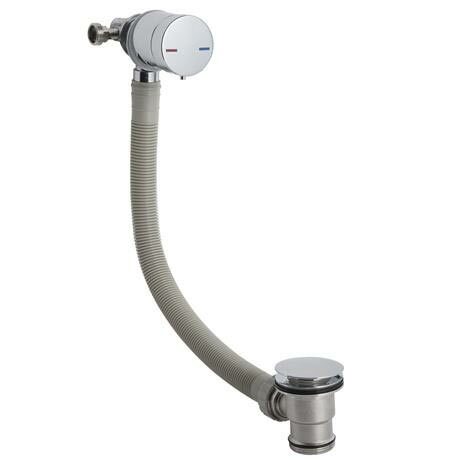 A stylish modern single lever freeflow bath filler from Premier, features a waste, bath filler spout and overflow - suitable for baths up to 10mm thick. It is ideal for a clean and simplistic finish that gives your bath a contemporary feel. It eliminates the need for taps, integrating the faucet with the valve in a subtle but stylish way. It is easy to use and creates a stunning aesthetic meaning that you don't have to compromise on style or practicality. Requirement - Suitable for all plumbing systems. Q. Could you use this on a bath where the overfill/waste is in the center or does it stick out too much? Hi, it could be used on a bath with the overflow in the centre yes, but the waste would have to be in the centre of the bath also. The connection between the waste and overflow is adjustable in length from 350mm to 500mm. It would stick out slightly further than a standard overflow but not enough to get in the way when bathing. Hope this helps, pleas let me know if you need any further info. Hi Ali, yes this bath Filler is compatible with that item. Hope this helps.